Chinese handset maker Xiaomi launched two devices - smartphone Redmi 2 and first tablet from its 'Mi Pad tablet' stable - in India on Thursday. Priced at Rs.6,999, registration for Redmi 2 will start Thursday at 6 p.m. and the flash sale will be held on March 24 on e-commerce portal Flipkart. "In the first flash sale we expect to sell 30,000-40,000 units of Redmi 2," Xiaomi's India Head Manu Jain said. 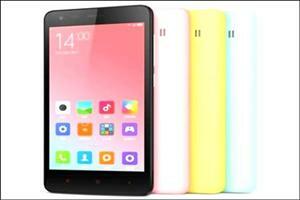 Redmi 2 has 4.7 inches display with quad-core 64 bit Snapdragon 410 processor and 4G Dual SIM. It also has 8 mega pixel (MP) rear and 2 MP front camera. Priced at Rs.12,999, the Mi Pads with 7.9 inches display will be up for flash sale on March 24. These tablets are however only Wi-Fi compatible. Asked about the company's sales target of Mi Pads, Hugo Barra, vice president international, Xiaomi said: "We do not have any target now. This is our first tablet in India. We are testing the market." The company, also know as 'Apple of China', is also planning to set up a manufacturing unit in India. Elaborating on its plans Barra said: "It will take us at least around 12-18 months to start production in India." The company, which entered India in July 2014 and clocked sales of 1 million units till December 2014, is planning 100 exclusive service centres in India by 2015. "We will also have some experience centres where people can go and experience Xiaomi products. We will have the first experience centre by April first week," Jain said.